The Science Of Why Sandy Is Such A Dangerous Storm : The Two-Way Hurricanes often weaken as they travel north across colder water and approach land. But Sandy hasn't. A Dare County utility worker checks on conditions along a flooded Ride Lane in Kitty Hawk, N.C., Monday, Oct. 29, 2012. 1. Sandy is one of the largest hurricanes ever to strike the U.S. Sandy's winds cover an area of more than 1,000 miles in diameter. That's enormous by hurricane standards. So instead of affecting an area a couple of hundred miles across, Sandy will cut a huge swath. That means many millions of people are probably going to be exposed to high winds, heavy rains, and, for those on the coast, powerful storm surge. 2. Sandy is a very slow-moving storm. Sandy was slowing as it turned inland in a northwesterly direction. That means many places could see two full days of heavy winds and rain, not just a few hours. Sandy is now packing winds of more than 90 miles per hour, according to latest update from the National Hurricane Center. 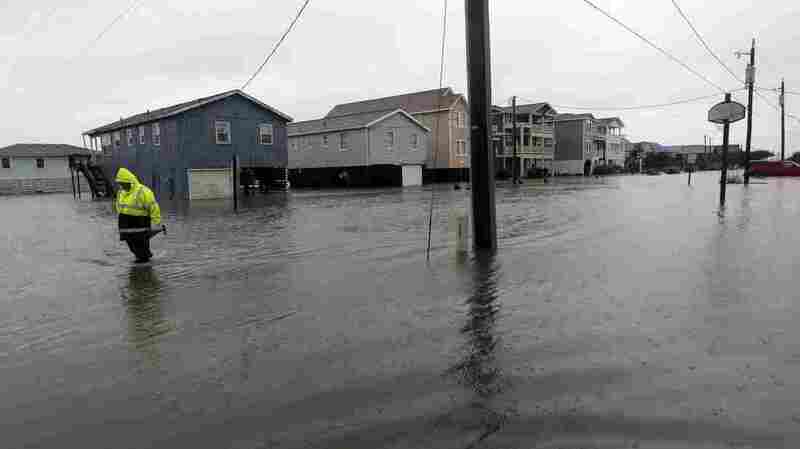 Forecasters say some places will get a foot of rain and they expect widespread flooding, wind damage and power outages. 3. Sandy remains strong as it reaches the coast. Hurricanes often weaken as they travel north across colder water and approach land. But Sandy hasn't. One reason is that it's expected to change from a tropical storm powered by warm ocean water to something more like a winter storm powered by temperature and pressure differences in the atmosphere. So it will be a hybrid, or "Frankenstorm." And forecasters say Sandy may actually gain strength slightly as it reaches land. They also think it will remain strong enough once on land to produce strong winds far inland. 4. Sandy is arriving during high tides. October 29 is a full moon and the highest tides usually come a day or two after that. So the "life-threatening" storm surge caused by Sandy's winds is likely to coincide with several very high tides. Forecasters say in some places, the combined effect could push tidal waters 11 feet higher than normal — a level usually associated with much more powerful storms. 5. Sandy is bringing cold air and snow as well as wind and rain. Forecasters expect Sandy to meet a mass of very cold air from a winter storm about the time it reaches land. This cold air will be incorporated into the hurricane, which means in some places torrential rains will be followed by temperatures in the 20s. It's situation with "two events amplifying each other," David Nolan of the University of Miami told NPR's Joe Palca. That's a big problem if you don't have power or heat. Also, Sandy is expected to produce two feet of snow or even more in parts of West Virginia. So the problems of extreme winter and summer weather will be wrapped into one storm. 6. Sandy is likely to affect New York City. Last year's Hurricane Irene was a reminder of how vulnerable Manhattan and the other boroughs are to storm surge. Even though Irene had weakened to a tropical storm by the time it reached Manhattan, it still caused the Hudson to flood the Meatpacking District. Many forecasters say Sandy could be much worse. Bad news in a place where many subway tunnels are lower than the Hudson already.